Next comes the peanut butter cheesecake batter. It’s a simple cream cheese based recipe that adds peanut butter. I use Skippy Naturals (no stir) peanut butter almost exclusively, because it’s what I like best. This recipe hasn’t been tested with real “natural” peanut butter. The cheesecake recipe also has some Greek yogurt in it, for smoothness. Most of the time I add sour cream to my cheesecakes but I was out of sour cream. Plain Greek yogurt is a great substitute for sour cream. Once you have both batters prepared, the pretty happens. 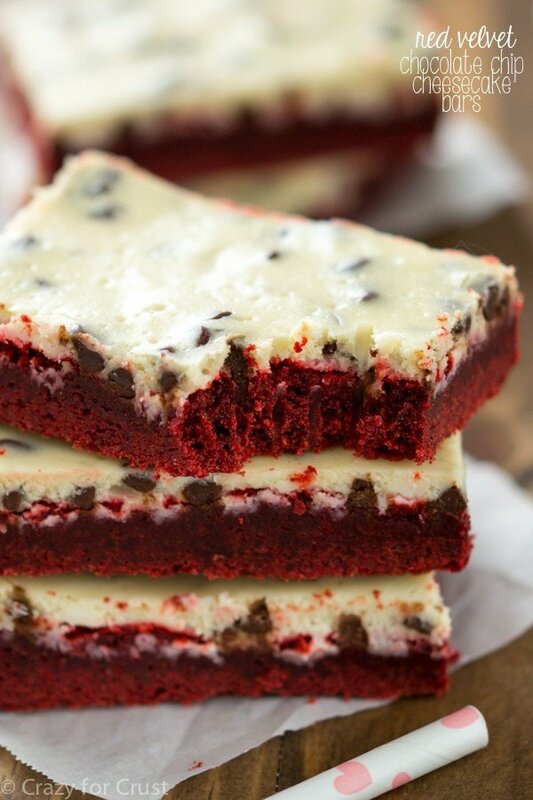 Half the brownie batter gets spread in the pan, then you layer half the cheesecake batter on top. 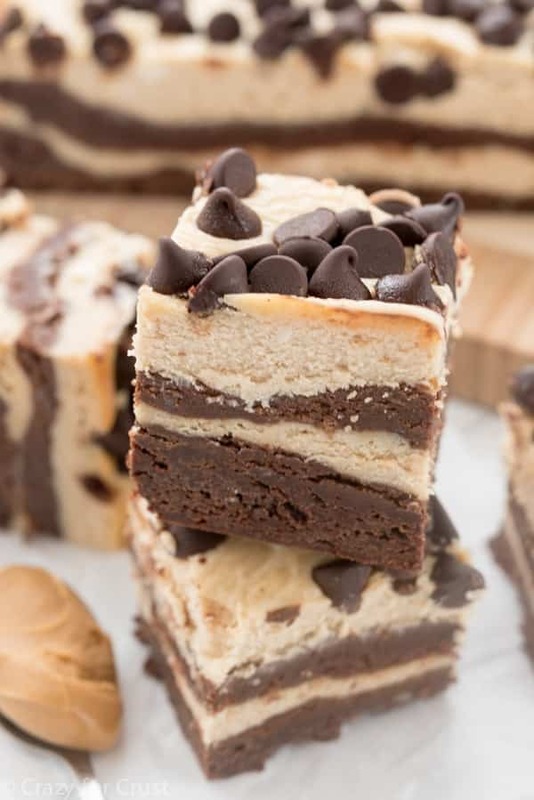 Repeat the layers and then sprinkle the top with more chocolate chips before baking and you have a gorgeous and decadent cheesecake brownie bar. 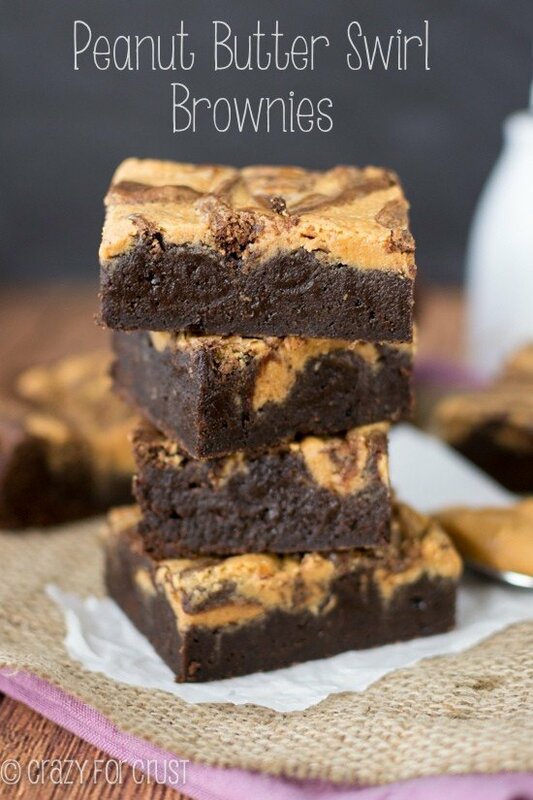 These Peanut Butter Cheesecake Brownies are a showstopper dessert! 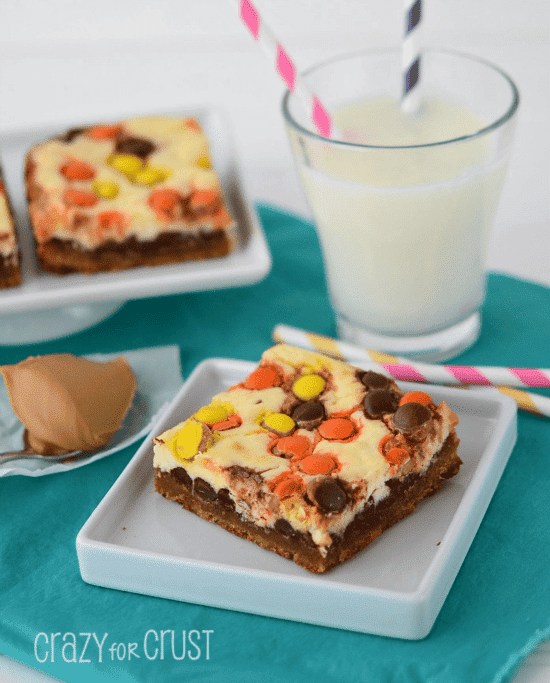 They're dense, fudgy, peanut buttery, full of cheesecake, and they're GORGEOUS! 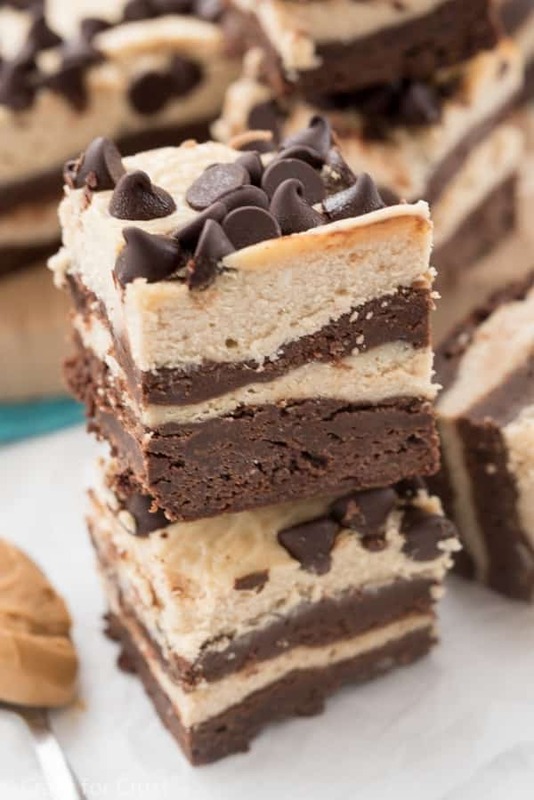 Great for giving and parties or just because you want peanut butter, cheesecake, and brownies! Preheat oven to 350°F. Line a 9x9” square pan with foil or parchment paper and spray with nonstick cooking spray. Make the brownie batter: place butter and 1 3/4 cups of the chocolate chips in a large microwave safe bowl. Heat for 1 minute on high power, stir. Continue heating in 30 second increments, stirring between each, until chocolate is melted and smooth. Stir in brown sugar and 1/2 cup granulated sugar. Stir in 3 eggs and 1 teaspoon vanilla extract, then add 3/4 cup flour, cocoa powder, and salt and mix until smooth. Set aside. Make the cheesecake batter: beat cream cheese with a hand or a stand mixer until smooth and creamy. Add peanut butter, 1/4 cup sugar, and sour cream or greek yogurt. Mix until smooth, then add 1 teaspoon vanilla, 1 tablespoon flour, and remaining 2 eggs. Beat until smooth without lumps. Spread half the brownie batter in the prepared pan. It’s a thick batter but should spread easily with a wooden spoon or spatula. Place half the cheesecake mixture over the top and spread carefully. If you have an offset spatula, that makes spreading this layer easier. 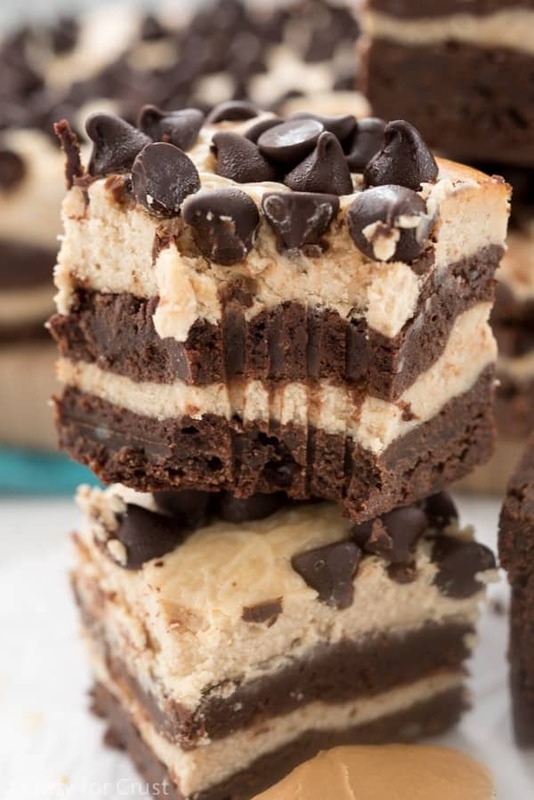 Top with remaining brownie batter and then the remaining cheesecake to create 4 layers. Sprinkle with remaining chocolate chips. Bake for 45-55 minutes until the edges start to get golden and the center is set. Cool completely at room temperature. Chill to set, at least 2 hours or overnight. Cut into small bars and serve. This cheesecake is very rich and a little goes a long way! Store in an airtight container in the refrigerator for up to 3 days or freeze for up to 1 month. This look amazing! Just wondering – could I use a box brownie mix instead? I happen to have that on hand. If so – should I buy the 13×9 size, use two 9×9 boxes (because I have a sneaking suspicion the 13×9 box is the same as the 9×9 boxes and only labeled family size because those always come out super thin! ), or just use one 9×9 box? Will it come out right or should I just make the from scratch brownie mix? You can use one family size, especially with the cheesecake they’ll be thick enough!! Enjoy! I’ve never made it without, but you can try and see how it works! This looks amazing and I’m planning to make it tomorrow for my boyfriend (it’s his birthday). What temperature are you baking these at for 45-55 minutes? I don’t want to mess this up! Oh no!! I just put this into the oven and forgot the 1 tbls of flour, will it be ruined?? I was just wondering if you have tried doubling the recipe and baking it in a 9×13 pan? If so, how long would you reccomend baking it?